I wouldn't think I would hear the word "Digimon" again after so many years. Digimon was popular back when I was in school. It is also known as "Digital Monsters". It is based on the anime TV show about a group of kids who fell into Digiworld and it is up to them and their Digimon partners to save both Earth and the DigiWorld. This picks up after both worlds were saved and now it is years later, the kids have grown up and lived in a normal life without Digimon. Once again the kids come back together again with their Digimon partners to fight the evil Digimon invading the human world in a six part film. Reunion, Determination, and Confession is the first 3 installment. These are great stocking stuffers for Digimon die hard fans or anyone who lived during the Digimon era. This would put a smile on their face. The enthralling monsters battles and classic adventures of DIGIMON have captured a special place in the hearts of millions and continue to stand as an enduring global pop culture phenomenon since the late 1990s. On May 16, 2017, Shout! Factory, in collaboration with Toei Animation, is proud to present new anime feature DIGIMON ADVENTURE Tri. – REUNION on home entertainment shelves in the U.S. and Canada. Produced by Toei Animation, DIGIMON ADVENTURE Tri – REUNION is DIGIMON’s first feature-length movie since 2000 and has already delighted audiences and loyal fans across Japan. This highly sought-after film reunites the characters and original cast from the classic series and picks up where the beloved DIGIMON Adventure 2002 series ended. 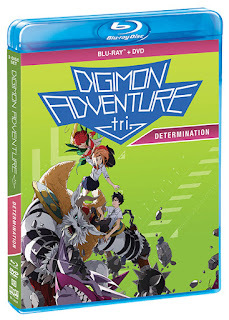 Available for the first time on North American home entertainment shelves, each highly collectible edition of DIGIMON ADVENTURE Tri. – REUNION Blu-ray™ boasts exciting movie presentation (featuring both versions - English voice cast and the original Japanese audio with English subtitles) and contains insightful bonus content. 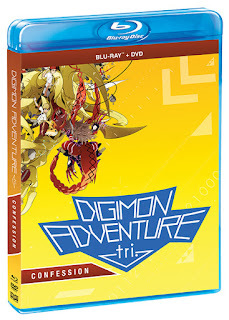 The Blu-ray Combo Pack allows viewers to enjoy DIGIMON ADVENTURE Tri. – REUNION on the platform of their choice and includes spectacular movie presentation on Blu-ray, DVD and a digital copy of the movie. 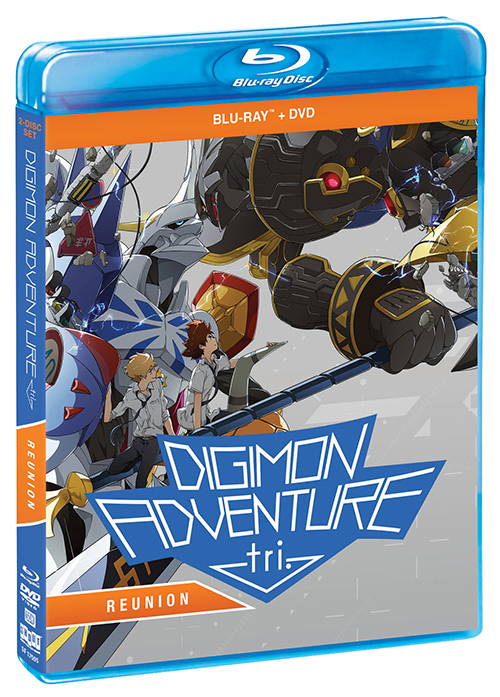 A must have for collectors, loyal fans and pop culture enthusiasts, DIGIMON ADVENTURE Tri. – REUNION debuts in stores everywhere. The collectible Blu-ray Combo Pack is priced to own at $24.97; DVD has a suggested retail price of $14.97. On August 15, 2017, Shout! Factory, in collaboration with Toei Animation, is proud to present new anime feature DIGIMON ADVENTURE Tri. – DETERMINATION on home entertainment shelves in the U.S. and Canada. 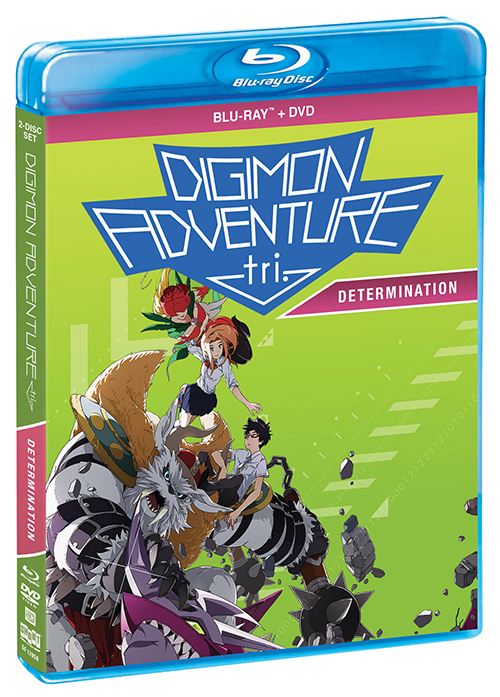 Available for the first time on North American home entertainment shelves, each highly collectible edition of DIGIMON ADVENTURE Tri. –Blu-ray™boasts exciting movie presentation (featuring both versions - English voice cast and the original Japanese audio with English subtitles) and contains insightful bonus content. 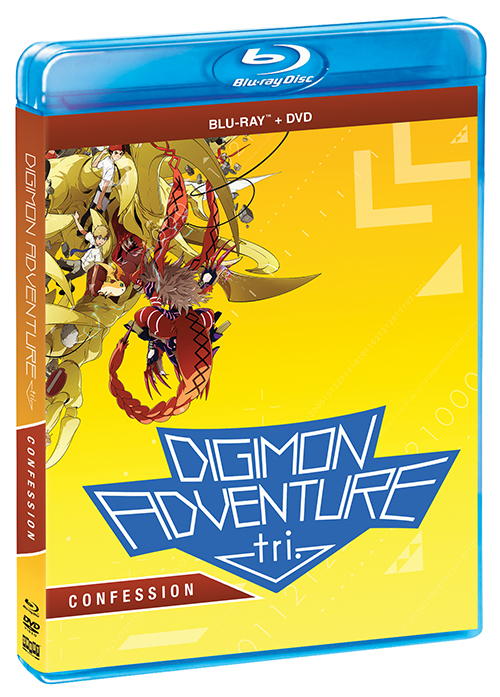 The Blu-ray Pack allows viewers to enjoy DIGIMON ADVENTURE Tri. – DETERMINATION on the platform of their choice and includes spectacular movie presentation on Blu-ray. 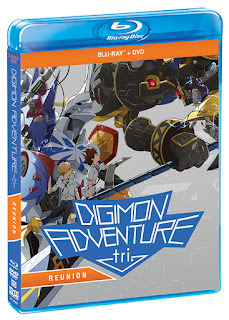 A must have for collectors, loyal fans and pop culture enthusiasts, DIGIMON ADVENTURE Tri. – REUNION debuts in stores everywhere. The Digi Destined and their Digimon partners take on an old foe and realized a friend is Infected in this new anime feature DIGIMON ADVENTURE Tri. –CONFESSION, the third feature-length movie from the highly popularDIGIMON ADVENTURE Tri. film series. Produced by Toei Animation,DIGIMON ADVENTURE Tri. – CONFESSION has already delighted audiences and loyal fans across Japan. Toei Animation has revamped DIGIMON ADVENTURE Tri. – CONFESSION for North American audiences by bringing onboard an exciting team of Englishvoice talent, boasting Joshua Seth (Tai Kamiya in the original series), Jeff Nimoy (Digimon Data Squad), Colleen O’Shaughnessey (Toy Story 3, Sailor Moon), Johnny Young Bosch (Mighty Morphin Power Rangers), Tom Fahn (Digimon: Digital Monsters), Kate Higgins (Naruto), Cherami Leigh (Sailor Moon Crystal), Mona Marshall (South Park), Laura Summer (Digimon: Digital Monsters), Vic Mignogna (Star Trek Continues), Tara Sands (Sailor Moon Crystal),Cristina Vee (Miraculous: Tales of Ladybug), among other notables. Upon seeing Meicoomon’s abrupt transformation, Tai and the Digi Destined search for answers about Meicoomon's infection. Izzy seeks answers from Meiko but she's lost all emotion. Izzy quarantines Agumon and the other Digimon in the office so that the infection can't spread any further, but Patamon starts to show signs of the illness. Agumon and the others use Kari's voice to tell the team about an important secret concerning the Digital World. Shout! 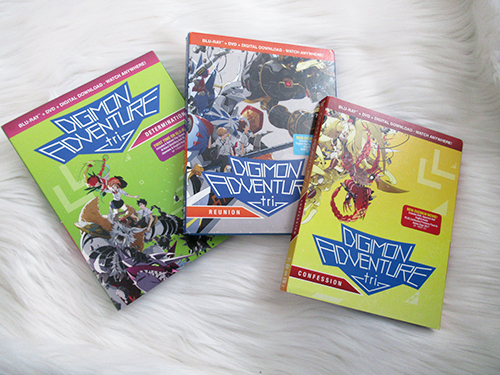 Factory would like to offer two of my readers to win their own copy of all three (Reunion, Determination, and Confession) Digimon DVDs. This giveaway will run from December 15th, 2017 to January 10th, 2018 (midnight EST). Winner, You have 24 hours to reply. You must be 18+ Open to Canadians and U.S. only Good Luck! Manitoba. I'd like any of the Adventure of Tintin DVDs. I live in NB and would like to check out the One Day at a Time DVD. Im from ontario and i would like to watch Adventure of Tintin DVDs. I am in Alberta, and I would like to watch the digimon movies! I'm in BC and my son wants the Digimon movies!!! Adam from Ontario! Would love to check out Sophie's Choice! From newark, Delaware. The adventures of Tin tin. I'm from Manitoba. I love DIGIMON ADVENTURE growing up. I am in Aberta. I would like to watch Rodgers & Hammerstein's Cinderella [50th Anniversary Edition] from Shout Factory. I'm in BC and I would also love to watch The Adventures of TinTin. Digimons aren't my thing, not sure about my grandkids though.